No Disney movie in recent years has had quite the same impact as Frozen. Young and old alike love this sing along classic featuring their favorite characters of Anna, Elsa, and Olaf, among others. From the music to the magic, Frozen has become a phenomenon. 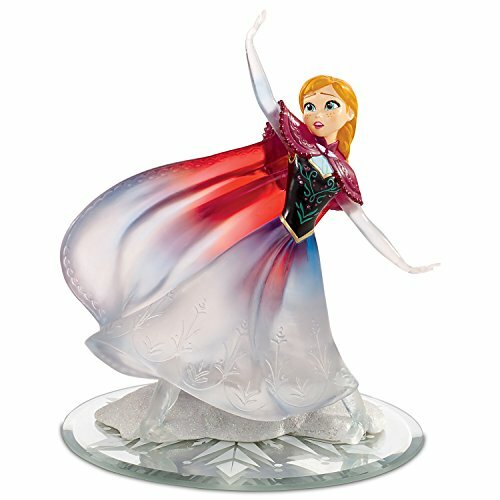 This Christmas, bring a little Frozen happiness to the ones you love with these Disney Frozen Collectible Christmas gifts, available from the Bradford Exchange. 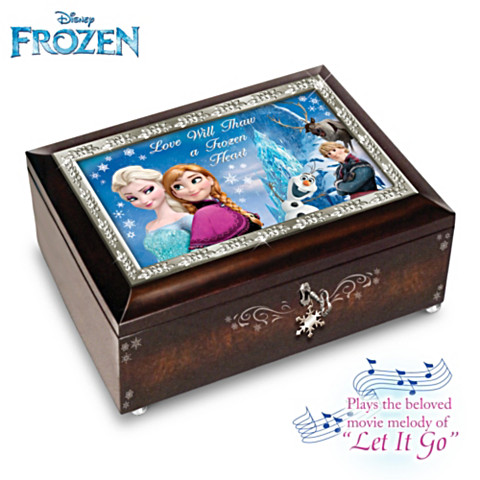 This is a beautiful handcrafted, velvet-lined music box that features the artwork from the movie Frozen. Music box plays the beloved song “Let It Go” and artwork features Elsa, Anna, Olaf, Sven, and Kristoff against a wintry background scene, with the phrase ” Love Will Thaw A Frozen Heart”. Features a decorative key, snowflake charm, silver colored ball feet, and a silver colored filigree framed lid. Music box itself is a light blue color and measures 4 inches wide by 6 inches long. Makes the perfect gift or a welcome addition to any Frozen collection. This music box features a masterfully crafted heirloom porcelain base with hand painted details. Box is also adorned with faux gems, silvery touches, and glittery highlights. Showcased is a sculpted topper of Elsa in her beautiful blue gown and a background crafted in translucent crystalline for a shimmering “icy” effect. 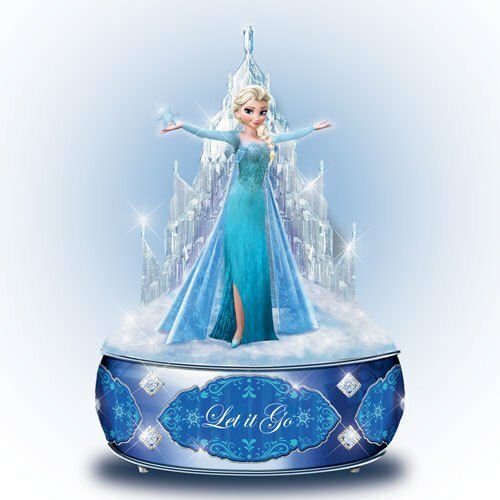 As with every music box in this line of Disney Frozen Collectible Christmas gifts, this music box plays a portion of the song “Let It Go”. Measures 3.5 inches wide by 5 1/4 inches wide. A music box that doesn’t look like your average music box, this one features the likeness of Olaf himself. This is a hand sculpted, hand painted, heirloom porcelain piece that captures all the details of everyone’s favorite snowman. 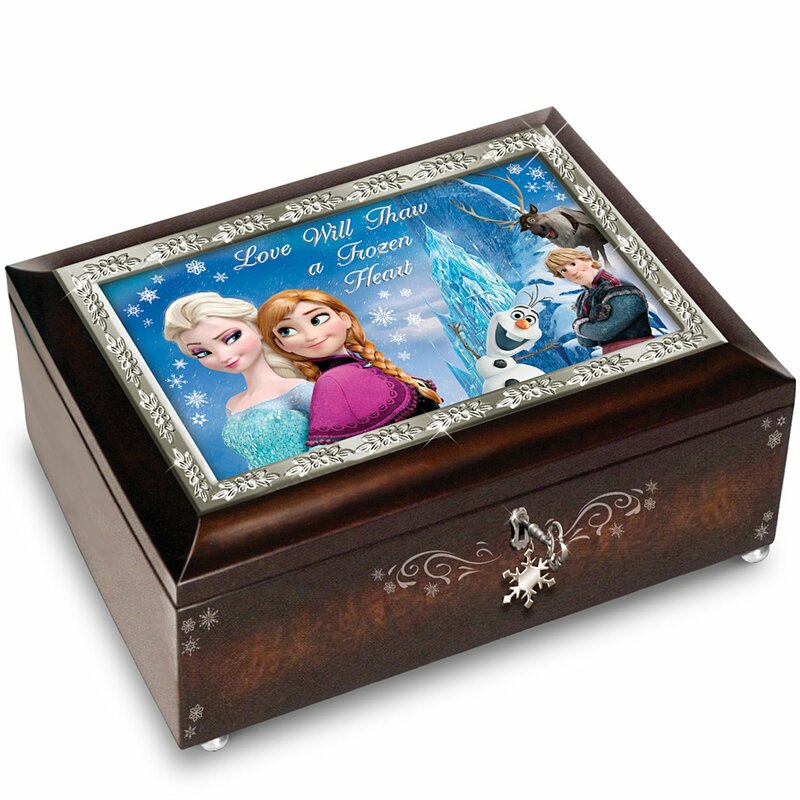 Box opens by means of a silver hinge and plays the movie favorite “Do You Want To Build A Snowman?”. 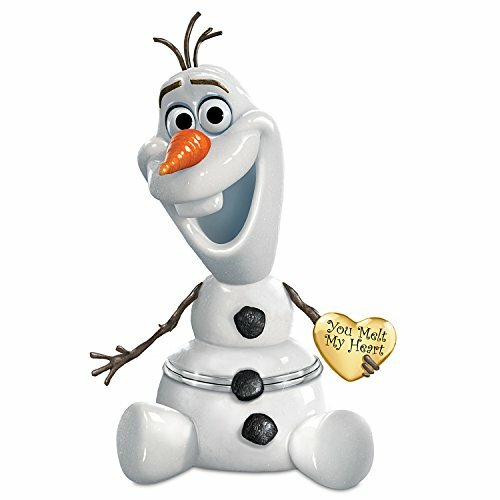 Olaf is holding a 22K gold heart in one branch “hand” that is engraved with the words “You Melt My Heart”. Music box measures approximately 6.5 inches high. This will become a treasured keepsake collectible that is sure to delight Disney fans both young and old (not intended for use as a toy, so supervision is recommended around young children). 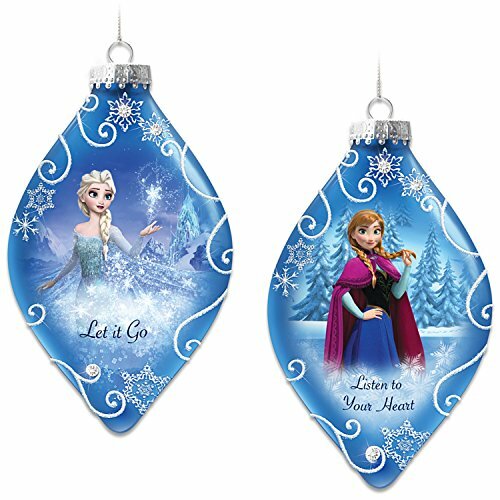 This set of two beautifully handcrafted glass ornaments features Elsa on one ornament with the phrase “Let It Go”, and her sister Anna on the other with the phrase “Listen To Your Heart”. Ornaments are in a tear drop shape and feature a raised relief filigree, simulated jewels, glittery accents, and a satiny finish. 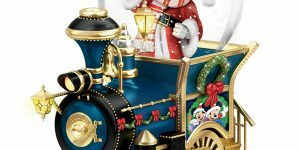 Both ornaments are blue and depict the Frozen character against a lovely winter scene. 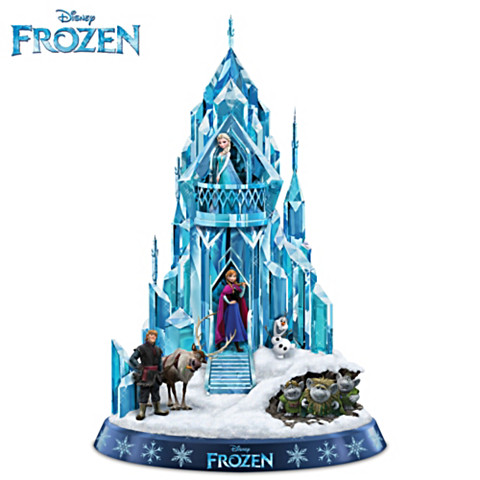 Not only are these ornaments the perfect Disney Frozen collectible Christmas gifts, they are the perfect way to bring the magic of this beloved movie into your home every holiday season. Each ornament measures 5 and 3/4 inches high. 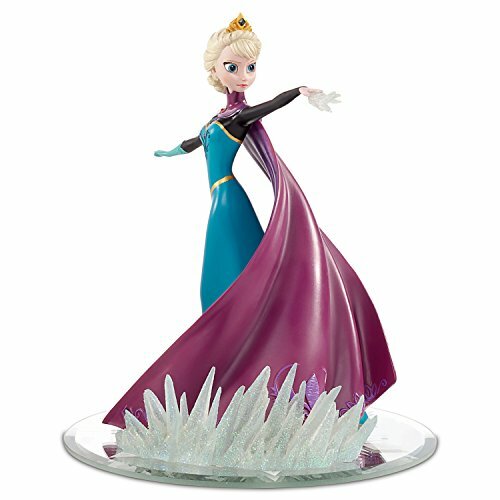 This adorable Frozen figurine collection begins with issue one, “Let It Go”, featuring Elsa in her lovely blue gown, standing in her wintry wonderland. 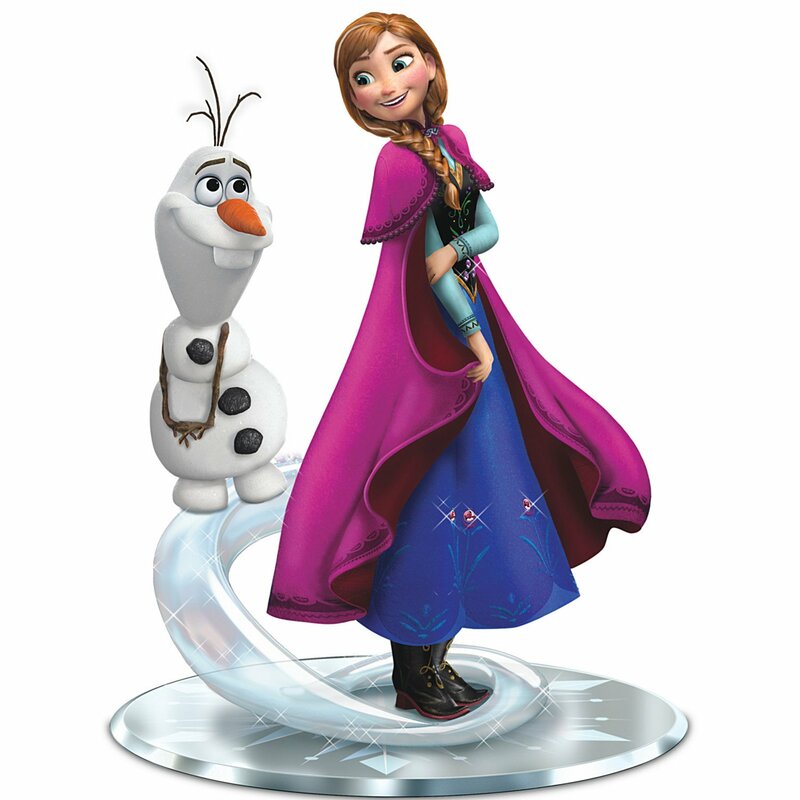 Issue two is Anna and Olaf standing in the snow in the “Do You Want To Build A Snowman?” figurine. 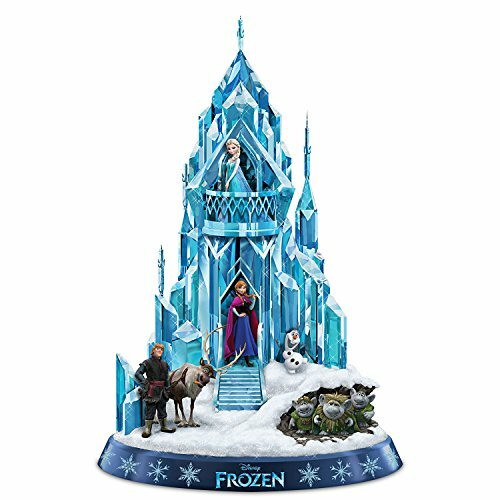 Frozen fans will delight in these detailed sculptures that are handcrafted and painted, with attention paid to details such as the addition of hand applied glitter and Swarovski crystals. Figurines are part of the Hamilton Collection and measure approximately 7.5 inches high. 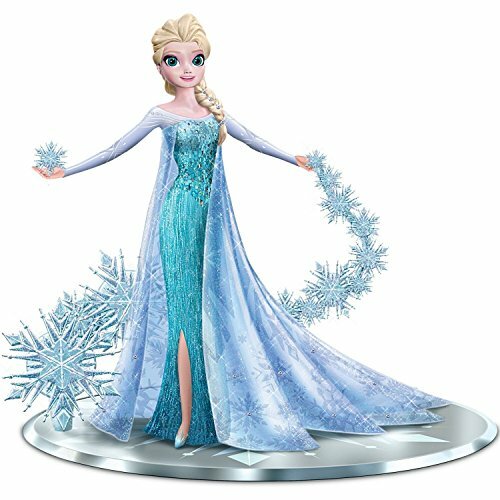 Elsa the Snow Queen with Swarovski Crystals: Let It Go Figurine Love Warms a Frozen Heart Anna Figurine with Swarovski Crystals Elsa Coronation Day Dress Figurine with Swarovski Crystals Anna and Olaf Figurine: Do You Want To Build A Snowman? This is a beautifully handcrafted piece that measures around 14 inches high. Elsa stands on the balcony of her ice palace while her sister Anna stands on the steps by the front door. Olaf is nearby, smiling happily as he stands in the snow. Sven and Kristoff are on had as well, standing off to the left side of the sculpture. Flip the switch and six blue LED lights illuminate the ice palace, making it the perfection addition to your holiday decor. Handcrafted from artist’s resin, the “Ice’ of the sculpture appears multi-faceted. Piece requires three AAA batteries, not included. Details include hand painting in vivid colors and hand applied glitter. Sculpture plays the beloved movie version of the song “Let It Go”. This Christmas, bring a little Frozen happiness to the ones you love with these Disney Frozen Collectible Christmas gifts.